MANILA, Philippines - Online job site Jobstreet has released on Thursday the 2016 salary report which focused on high-paying jobs and trends in the Philippine job market this year. In a press conference, Philip Gioca, JobStreet.com Philippines country manager said that JobStreet.com findings show that the information technology (IT) field continued its 3-year trend of providing the highest paying jobs across all position levels. Jobs in IT field include web developer, software developer, and systems administrator. 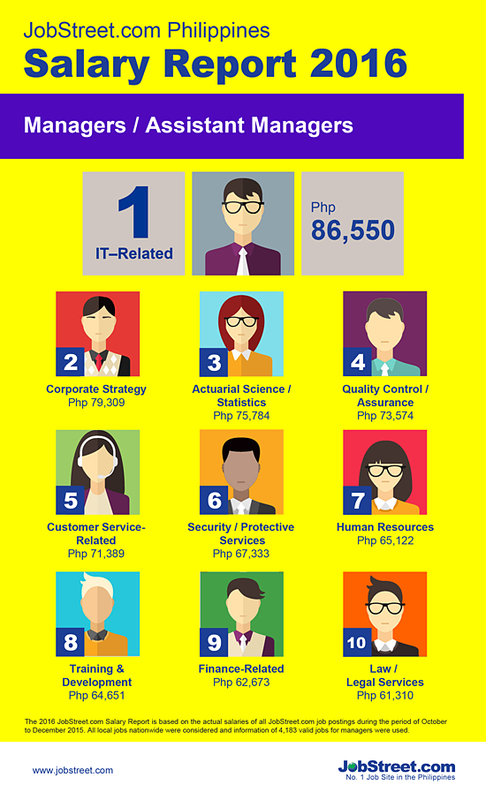 Managers in IT-related fields earned the highest average monthly salary at P86,550 in 2015, although this was 4.23% lower than the P90,374 average in 2014. Meanwhile, salaries across the top jobs in demand in the Philippines have increased by 10% compared to last year. Jobstreet added that salaries, especially for junior executives (employees with 1-4 years’ work experience) and supervisors (employees with 5-9 years’ work experience), increased from at least 2 to 12 percent). The significant rise is attributed to the good economy, lowest unemployment rates in years, and the resulting competitive play in the job market. 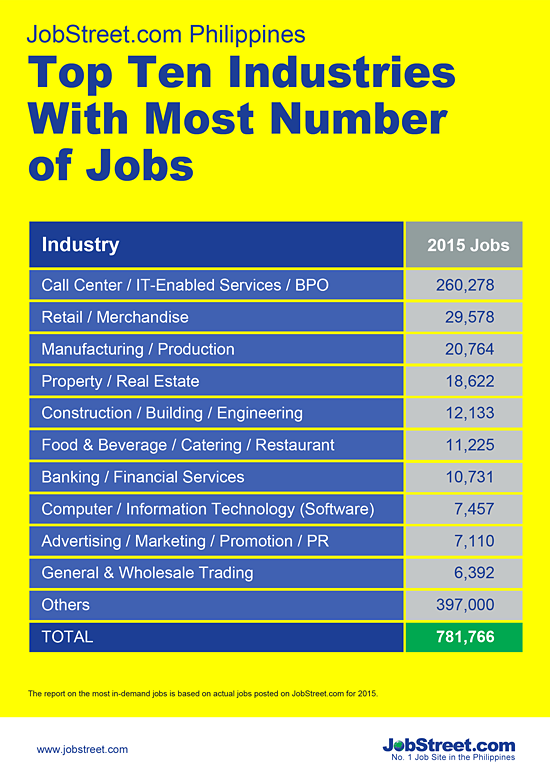 The business process outsourcing (BPO) industry continues to post the highest prospects for jobseekers in general with 260,278 jobs in 2015 or a third of the 781,766 available jobs advertised on JobStreet.com. Other industries providing the most jobs are retail and manufacturing.